This afternoon, Edelweiss, a sister-company of SWISS promoted a meeting with members of the press at Windsor Hotel in Copacabana to mark the initial flights of the airline to Rio de Janeiro, Brazil. The company started its operation to the marvelous city last Friday. Initially the airline will operate flights between Zurich and Rio de Janeiro on Mondays and Fridays. There were present executives of Edelweiss, SWISS, Lufthansa, RIOgaleão and Switzerland Tourism, which presented couple of key facts through a slide show presentation. It was also highlighted key facts of the flights from Zurich to Brazil (Rio de Janeiro and Sao Paulo). Tom Maes the recently nominated Senior Sales Director for South America of the Lufthansa Group – which took possession of the new cargo this month – highlighted a series of important facts regarding the operations of the group’s airlines to Brazil. He recognized the strong relation between the airlines and the commitment of the group with the country. It has also been stated the power of growth that the group has in Brazil, as the airlines can offer several types of services and can attend specific demands of the most variable customers. He also stated saying that Edelweiss’ flights will complement the Lufthansa Group’s flight offer to the region. Bernd Bauer, CEO of Edelweiss started its speech with an explanation of Edelweiss flower, the national flower of Switzerland that gave the name of the airline – as we mentioned this history in the Curiosity part of our article. He stated that the new Airbus A330-343 of Edelweiss has been named “Chäserrugg”, the region in Switzerland that grown this flower. Mr. Bauer complemented its speech saying that this flower also transports their origin, commitment and value. Bernd highlighted the cities, lakes and the beautiful nature of its country, showing couple of pictures of it. The airline’s CEO reiterated that national ingredients and recipes of Switzerland that are served on board. Finalizing its speech, he said the airline will take delivery of it first Airbus A340-313X from SWISS on the end of this year. Just to note: The first destinations of the airline’s first A340 will be Phuket, in Thailand and Cape Town, in South Africa. Valquiria Mendes, Senior Manager of SWISS for South America started saying that on the year of 2009 to 2011 the route from Zurich to Sao Paulo was one of the most profitable SWISS routes, proving the capacity that the airline has. 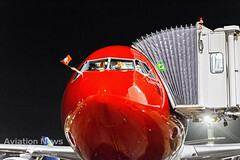 She added saying that SWISS’ flight from Zurich to Sao Paulo will make a stop in Rio de Janeiro on August 1st, 2016 to bring and on August 22th, 2016 to pick up the athletes and its equipment of the Summer Olympics 2016. 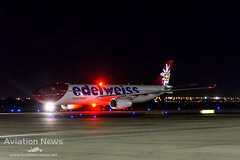 She also stated saying Edelweiss flights will be operated under codeshare agreement with SWISS and they aren’t competitors, their flights complements each other and continue to build a strong relationship. Finalizing its speech, the executive highlighted the renew plan of SWISS, which consists in renew its long-haul flagship from the Airbus A340 to the Boeing 777-300ER – this last airplane was designed in accordance with the demand of the passengers, the company has two Boeing 777-300ER on its fleet now and it is waiting more four aircraft up to July 2016. Adrien Genier, Marketing Manager of Switzerland Tourism highlighted key facts of the tourism between these two countries. Edelweiss bring more than one new route; it brings the Swiss DNA of great service with the genuine Swiss cordially. The airline will be a partner during the Summer Olympics 2016, a partner which comes supporting the promotion actions of the Switzerland Tourism in Rio de Janeiro. The executive also highlighted key facts of Switzerland, like the Alps, big lakes and the gastronomy. Mr. Genier presented couple features of Zurich Kloten Airport, which has train to all the parts of Switzerland inside the airport and has cars agencies one-minute walking from the check-in area. He finalized its speech saying that Switzerland’ inhabitants are the happiest people in the world. Luiz Rocha, President of RIOgaleão, made this speech based in a common thing between Edelweiss and the airport; both of them want to offer the best experience for the passenger. The executive also stated that the airport’s first part of investment is being concluded. This article is part of our coverage about Edelweiss inaugural flight to Rio de Janeiro. Red nose, the distinct “Switzerland” word on the fuselage and the famous oversized flower on the tail are the most eye-catching details, as any aviation aficionado knows, it is an Edelweiss’ aircraft. Last Friday (22), the airline has started the service from Zurich to Rio de Janeiro, the inaugural flight from Kloten Airport took off at 12:48 PM CEST and landed at 07:14 PM BRT at Galeão Airport. Initially, the company will operate this route twice a week – Mondays and Fridays – on a year-round basis. However, the airline has stated that the plans extend beyond Olympic games in 2016. Depending of the success of the route, frequency increases might be considered in the future. Edelweiss’ flights are complemented by the already existing flights of Lufthansa Group to Rio de Janeiro and Sao Paulo. 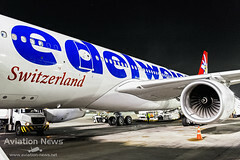 Edelweiss is a sister company of Swiss International Air Lines (SWISS) and in the same way the company flights will complement SWISS’ flights, which are operated daily from Zurich to Sao Paulo. The aircraft utilized on this route to the marvelous city is an Airbus A330-343, the second biggest member of A330 Family which now counts with the A330neo variants in development. Everybody knows that the Airbus A330 is one of the most cost-efficient aircraft in its class, the excellent short-field performance and long-range capabilities enable the A330 to be efficiently utilized both on established routes and expanding markets, like Rio de Janeiro, in Brazil and Calgary, in Canada. In numbers, the A330s fly to over 400 destinations around the world each week, and orders for this wide body twin-engine aircraft family have surpassed the 1,600 mark, from over 100 operators. Edelweiss was founded on 19 October 1995 in Bassersdorf, Switzerland, with just one airplane, a McDonnell Douglas MD-83. The fleet was expanding and renewed. In 1998, new Airbus A320 were introduced to replace the MD-83s, and in 1999 the airline long-haul flights started with an Airbus A330-200. From 2001 to 2008, Edelweiss received seven golden Travelstar Award for its excellent achievements. Up to November 2008, the airline was wholly owned by Kuoni Travel Ltd and had 190 employees, when the operating rights were sold to SWISS, in exchange for sale rights of hotel capacities via the SWISS sales network. When Edelweiss was bought by SWISS, Edelweiss became a subsidiary of Europe’s largest airline group, the Lufthansa Group which bought SWISS in 2005. 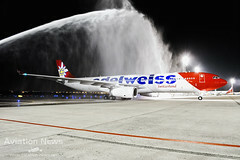 As of March 2011, Edelweiss added to its fleet the larger Airbus A330-300, with an order having been placed on April 05th, 2010. On last July, it was announced that Edelweiss will receive three Airbus A340-313X from SWISS. The first airplane will join Edelweiss’ fleet in the 4th quarter of 2016 and will operate flight from Zurich to Cape Town, in South Africa and Phuket, in Thailand. Last November, the airline introduced its new revised livery on one of its Airbus A320-200, the new livery is gradually being applied to the entire fleet. There is an A330-300 with the new livery, tail number is HB-JHR. Edelweiss stated that all aircraft will subsequently be painted with new livery. According to current planning the entire fleet will be painted in the new livery until Summer 2017. Airline’s premium product is well known as one of the most comfort Business Class on the aviation industry. In the A330-300 there are 27 full lie-flat seats with two seat configurations, 1-2-1 and 2-2-1. Among with all the services offered on Business Class by all the airlines, Edelweiss highlight herself by welcoming the client and presenting them that sleep and dream at 30.000 feet will not be a problem, with the anatomical Business Class seat convert in a two-meter-long bed in a short time at all. Pillow, blanket and amenity kit are also provided for a complete rest. A wide range of on board entertainment is offered on a 16” HD touch screen monitor and the passenger will not have their gadget out of battery due to a mains socket to charge it up. To finalize all this comfort, it is worth to highlight again the excellent on board service provided by the crew of the flight. Everything is guaranteed to make sure the client will arrive refreshed and rested in their final destination. Regarding the lounges which Business Class passengers are eligible to use, in Zurich the lounge utilized is the SWISS Business Lounge and in Rio de Janeiro the lounge is Smiles VIP room. This class can accommodate up to 56 passengers in a 2-4-2 seat configuration. Pay for a price closer to an Economy fare but fly with the maximum comfort that Economy can provide, this is the idea, make economy flight pleasanter. Seat back and enjoy 15 centimeters more legroom between the seats, and up to five centimeters more recline angle than Economy Class, here is the “magic”, just close your eyes and you will comfortably be able to relax peacefully. The seat also counts with a 9” HD touch screen monitor. Accommodating up to 232 clients in a 2-4-2 seat configuration and 2-3-2 on the back part of the fuselage, a huge part of the people think that paying less for a ticket will have almost any benefit on board, but this idea doesn’t work with this airline. The company has everything that makes sense for a relaxed journey, such as: adjustable headrest, patented anti-thrombosis pad that supports the circulation in passengers’ leg. Everything is so comfortable that the journey will be pleasant and with a huge entertainment system on a 9” HD touch screen monitor, the flight will be valuable. The flight isn’t passing? No problem, in front of you there is a HD touch screen with more than 180 movies and TV programs for you choose freely. But this isn’t all, if the passenger wants to sink in the world of music, there are 270 CDs and playlists to choose from. There are also games to play, they can offer for the client Sudoku or multi-player 3D games. And in case if the passenger wants to read a little bit, there is the “Sunflyer”, the on board magazine of the company. International and national newspapers and magazines are offered but they are subject to availability. All the entertainment selection is synchronized with their sister airline, SWISS. 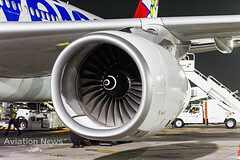 Edelweiss’ Airbus A330-313X is powered by two Trent 700 engines, with a 2.47-meter fan diameter, this engine delivers the power requirements for all A330 and particularly for the higher weight aircraft operation in harsh environments. The engine can generate a thrust of 72.000 lb and provides the best take-off performance and revenue-earning for its operators. It has been designed for growth capability of the A330 and incorporates materials capable of the pressures and temperatures required for 75.000 lb. When the passengers were disembarking at Terminal 2, the airline surprised everyone with Brazilian popular music (MPB) and a warm welcome. Every passenger received a typical Carnival necklace. Probably most of the people don’t know why they painted a white flower on its aircraft but this flower is named Edelweiss which is referred in biology for a plant with rugged beauty and purity which grows on high altitudes like in the Alps and Carpathians. This flower is a national symbol especially of Austria, Bulgaria, Romania and Switzerland. Edelweiss means in German edel “noble” and weiss “white”, literally like a “noble white”. This is why they have couple of flowers painted through their aircraft. As we can see, the company’s name is also derivate from the flower. SWISS will be adding Alicante to its network in its 2016 summer schedules. The port city on Spain’s Costa Blanca will receive thrice-weekly service from Zurich (on Tuesdays, Thursdays and Saturdays) from March onwards. Alicante lies at the heart of a key tourist region. Its airport is around ten kilometres from the city centre. The flights will be operated with Airbus A320 equipment. The new Zurich-Alicante flights are bookable now. The flying time is around two hours and 15 minutes. There will be network innovations next spring at Edelweiss, too. SWISS’s sister carrier will be adding Calgary and Rio de Janeiro to its intercontinental network in its 2016 summer schedules. Calgary, which is Canada’s fourth-largest city, will be served twice weekly (on Thursdays and Sundays) from Zurich from the end of May 2016. The flying time is ten hours. Rio de Janeiro will also receive twice-weekly non-stop Edelweiss service (on Mondays and Fridays) from Zurich from the end of April 2016. The flying time here is 12 hours. Both destinations will be served with Airbus A330 equipment, and flights on both routes can be booked now. A Edelweiss vai operar novo voo non-stop do Rio de Janeiro para Zurique, duas vezes por semana. O serviço será durante todo o ano. “Estamos muito empolgados em adicionar o Rio de Janeiro como nosso primeiro destino regular na América do Sul em nossas rotas”, disse o CEO da Edelweiss, Bernd Bauer. “Com nosso produto de bordo “estado-de-arte”, dotado de assentos full lie-flat na classe executiva e nossa nova cabine Economy Max, vamos oferecer produtos e serviços suíços excepcionais, non-stop, do Rio de Janeiro para a Suíça”. A Edelweiss, companhia aérea irmã da Swiss International Air Lines (SWISS), vai operar o novo voo non-stop com um Airbus A330-300 a partir de abril de 2016, oferecendo uma cabine long-haul totalmente nova. A Edelweiss Business Class é equipada com 27 assentos full lie-flat (reclinação horizontal) e um novo Sistema de entretenimento de bordo que inclui telas de 16 polegadas. Além disso, a Edelweiss apresenta a nova Economy Max que oferece aos passageiros 15 cm a mais de espaço para as pernas e muitos outros ítens de amenidades para garantir um voo confortável. A classe econômica da Edelweiss foi também recentemente remodelada com novos assentos e novo Sistema de entretenimento que inclui telas Touch Screen. Dia da semana Voo Início Parte Chega Equip. A possibilidade de combinar os voos diários da SWISS que partem de São Paulo para Zurique com o serviço da Edelweiss de/para o Rio de Janeiro, oferece opções ainda mais atrativas aos viajantes. Os novos voos serão publicados nos sistemas de reservas no início de junho de 2015. As reservas poderão ser feitas com antecedência de até 340 dias das datas dos voos. Os voos da Edelweiss partindo do Rio de Janeiro podem ser reservados no www.swiss.com, nos principais websites de reservas online ou em qualquer agência de viagens. Para mais informações, visite www.flyedelweiss.com.